Instructions: One A4 page. Basic assembly guide with painting guide included. Overall Rating: 6 - much better than Airfix or Monogram, but the inaccuracies hurt. 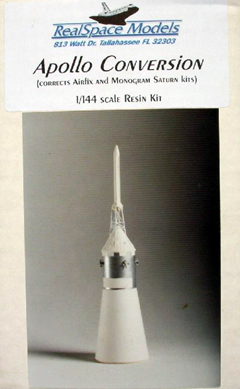 This is my first resin kit which I built for my Airfix 1/144 Saturn IB. The Airfix kit suffers from the service module (SM) being 3 mm thinner and being Block I instead of II. The RealSpace kit corrects these defiencies, but unfortunately suffers from a number of inaccuracies. 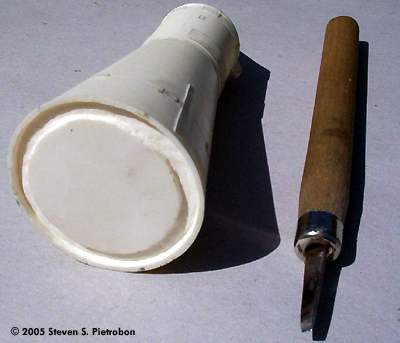 Image: Base carved so it would plug onto S-IVB. Image: Parts prepared for painting. Image: The left kit is from my Saturn IB which I built up as a latter Block II. 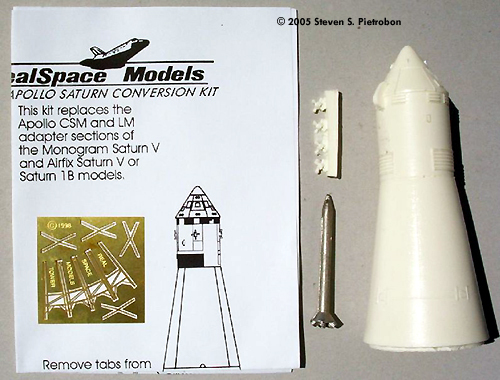 The right Airfix kit is from my Saturn V which I built in 1977. Note the ant on the SLA! 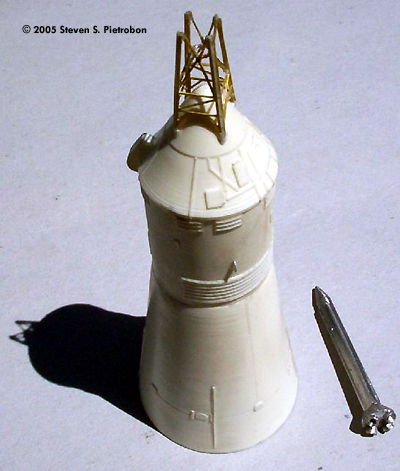 Starting from the top, the white metal Launch Escape Tower (LET) is oval in shape, most likely due to being copied from the Airfix kit. The outer most window panel covers on the boost protective cover (BPC) are too low. The top and bottom radiators on the SM are in the wrong positions. The bottom radiator should have thin radiator above it. The hinges on the spacecraft launch adapter are closer to the earlier SLA's as used on Apollo 7, but not for latter Apollo flights, which are much more pronounced. I started by first washing the resin parts to remove any risidual mold release. The instructions say to cut the flange on top of the S-IVB and superglue the SLA directly to the S-IVB. However, I wanted to be able to exchange my Airfix SLA and be able to see the top of the S-IVB. So, I cut off as much of the base with a thin saw as possible, filing and sanding off the rest. I then drew an inner circle with pencil. I used this as a guide to carefully remove the resin inside the circle using a wood carving tool. Lots of resin dust was generated, so I wore a mask to keep my lungs clean. I then started to correct some of the details of the kit. Using plastic card I added four small circles with the bottom cut off between the hinges. I also trimmed the hinges to be shorter. Long thin pastic card was added to the right side of the hinges. Two small semicircular antennas using plastic card were added between the thruster pods on the SM. This meant the antennas were misaligned with the bottom radiators. I don't know why these parts were not included with the photoetch. I had to clean up some scratches under the umbilical between the command module (CM) and SM. These were most likely caused by the umbilical scratching the mold in previous castings. There were a small number of bubbles and pinholes to fill in. The thruster pods were very difficult to remove and clean up. I ended up breaking off three engines, one which I lost and had to scratchbuild. These look like to be a copy of the Airfix parts. For the LET trusswork, I added a small circle made from copper wire between the four separate bent trusses. Again, I don't why this part is not included in the photoetch. I had to sand the LET quite a bit to get a smooth finish. There was also some flash in the separation rockets which was hard to remove. I then airbrushed three coats of satin white onto the assembled parts. I did not glue the LET at this stage, as the engine nozzles would need to be painted later. The SM was masked. Different to later Block II SMs, there are additional white areas near the thruster pods. I aligned these to the bottom radiators which meant they were misalgned with the thruster pods. The SM was then painted with my old 25 year old Humbrol silver. After removing the masking tape, the other details were painted. I touched up the silver with my 0/20 brush, the finest I could buy. The porthole in the BPC was painted gloss block. The umbilical was painted with my new Humbrol silver (after removing excess liquid). The LET nozzles were painted brown with the tip painted silver. The kit does not include any decals, so I had to make them myself. The US logo and flag were printed on white decal paper on my inkjet printer. The four small "portholes" near the top of the SLA were printed on my laser printer. You can download these decals here. These decals also include the S-IB fin markings and the US logo and flag for the Lunar Module. The LET was then superglued in place. I placed small pieces of decal paper on the front two legs so as to get the alignment right. Finally, I painted the base a greeny brown colour and took some photos. The RealSpace Apollo conversion is a significant improvement over the Airfix and Monogram kits. However, it seems to have been rushed together, with many annoying inaccuracies. There are also parts missing which could have been easily included with the photoetch. 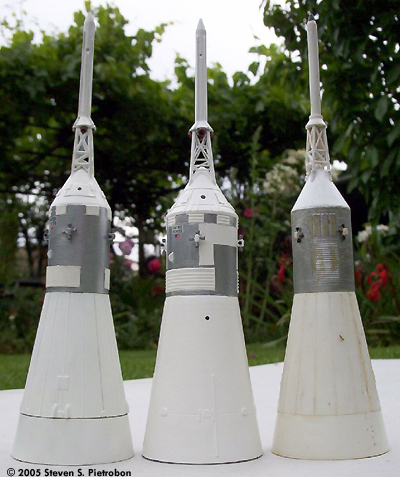 The final word on a 1/144 Apollo Spacecraft has yet to be made. References: R. Godwin, "Apollo 7: The NASA Mission Reports," Apogee Books, 2000. This page copyright © 2005 Starship Modeler. First posted on 27 January 2005.